Being Indians we all know quite well that a wedding is an extremely lavish and grand venture for us. Many of us Indians are wedding buffs who love to meticulously plan family weddings in extreme detail. Although traditional Indian weddings are still in vogue, the concept of a ‘Destination Wedding’ is fast gaining popularity in India. A Destination Wedding can be a ‘dream come true’ wedding style for all those love birds who plan to get married and want their wedding to be unique as well as exhilarating. 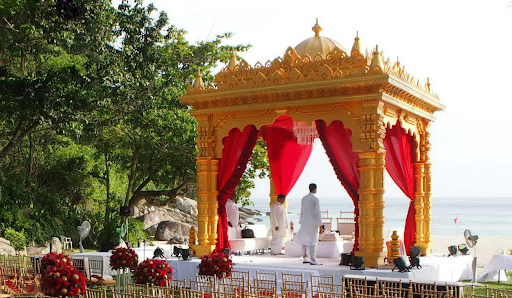 Although Destination Weddings are the trend these days, still a lot of us might not be familiar with the concept and might as well be wondering why to opt for it? So let’s figure out how Destination Wedding can decorate your dream day. The very thought of getting married at some exotic destination away from your hometown entices as much as it excites you. The prospect of exchanging nuptial vows at some gorgeous destination that one is completely new to, does excite all and sundry. That’s exactly what a Destination Wedding is all about, marrying far away from the place where the bride and groom currently live. Reasons To Go For A Destination Wedding? Each and every Destination Wedding is unique. The idea of having a Destination Wedding accords you the opportunity to stand out of the crowd. To yourself and to everyone supposed to attend your wedding, all the wedding spots in your hometown indeed seem old and thus, unappealing. Choosing a Destination Wedding affords you the convenience of not having to choose from the same old hometown spots that all your friends and relatives book for marriage functions. With a Destination Wedding in an exquisite location that is abound with natural beauty, the hassle of going through the pain and effort of setting up artificial decor is completely eliminated. Traditional Indian weddings often end up being a saga of a swarm of unmanageable invitees. Since Destination Weddings call for a long journey and a ‘longer than usual’ stay period at the wedding location, they can be a great excuse to cut short that long list of invitees and keep the event exclusive to the dearest ones. In stark contrast to the traditional weddings which last for a couple of hours, a Destination Wedding spans a couple of days. The bride and the groom can thus spend ample quality time with their loved ones. The concept of a Destination Wedding, while being thrilling, opens up a number of options for you such as celebrating the honeymoon in the same resort venue as that of the Destination Wedding. Such options make the prospect of a Destination Wedding even more attractive to many people. A seasoned wedding planner is your saviour when it comes to planning a Destination Wedding. Choosing the most appropriate wedding planner definitely helps one perfectly execute the plan of a Destination Wedding. WhiteWaterEvents is one of the most renowned wedding planners having ample experience in successfully arranging grand Destination Weddings across the globe. At WhiteWaterEvents, we courteously shoulder all the responsibilities that come along with planning a Destination Wedding. What’s more, we offer the most affordable and cost-competitive Destination Wedding packages. First off, our planners help you choose the perfect destination. With us, the vast expanse of the entire world majestically stands before you to choose from. Having finalized the destination, we, together with you and your family, plan and schedule all the nuptial ceremonies and rituals. Next, in consultation with you, we assist you in preparing the list of invitees. Thereafter, we fully take over the reigns and right from flight ticket bookings to hotel reservations to preparing the venue at the destination, we leave no stone unturned in thoroughly planning and scheduling every minor as well as major detail. Choose WhiteWaterEvents and enjoy a hassle-free Destination Wedding that you’ve always dreamed of.